The set consists of 3 books. "Gopi bhagya madhuvrata srngiso dadhi sandhiga khala jivita khatava gala hala rasandara"
O Lord anointed with the yogurt of the milkmaids' worship (Krishna), O savior of the fallen, O master of Shiva, please protect me. Is that a prayer to Krishna or a consonant code for the solution of pi/10 = 0.31415926535897932384626433832792? Or both? Vedic mathematics is composed of sutras, which have been formulated over many centuries, some of which have been lost over the centuries due to neglect. With the dedicated efforts of a few enthusiasts it is being revived to its previous glory. The pioneer in this field was Jagadguru Swami Sri Bharati Krishna Tirthaji Maharaja, who compiled sixteen sutras and unleashed this wonderful science to the world. He wrote sixteen volumes encompassing some of the greatest Vedic sutras but all were lost and he finally wrote one book explaining the sixteen sutras before his death.. This epoch-making, monumental work unfolds a new method of approach. It relates to the truth of numbers and magnitudes equally to all sciences and arts. The book brings to light how great and true knowledge is born of intuition, quite different from modern Western method. Vedic scholars did not use figures for big numbers in their numerical notation. Instead, they preferred to use the Sanskrit alphabets, with each alphabet constituting a number. Several mantras, in fact, denote numbers; that includes the famed Gayatri mantra which adds to 108 when decoded. 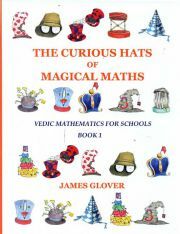 This book by James T Glover might come a little late for you but Vedic Mathematics for Schools offers a fresh and easy approach to learning mathematics in schools. It is not too late to learn to appreciate mathematics. James T Glover is head of mathematics at St. James Independent Schools in London where he has been a teacher for eighteen years. He is director of mathematical studies at the School of Economic Science and a Fellow of the Institute of Mathematics and its Applications. He has been researching Vedic Mathematics and its use in education for more than twenty years and has run public courses in London on the subject. Vedic Mathematics for Schools offers a fresh and easy approach to learning mathematics. The system was reconstructed from ancient Vedic sources by the late Bharati Krishna Tirthaji earlier this century and is based on a small collection of sutras. Book 1 of the series is intended for primary schools in which many of the fundamental concepts of mathmatics are introduced. Topics covered include the four rules of number, fractions and decimals, simplifying and solving in algebra, perimeters and areas, ratio and proportion, percentages, averages, graphs, angles and basic geometrical constructions. The book contains step-by-step worked examples with explanatory notes together with over two hundred practice exercises. The material in this book is currently used at schools around the world assocaited with the Education Renaissance Trust. Please note that the CD's for Vedic Mathematics for Schools Vol I, II and III are available at extra cost. Please Click Here to contact us for more information. James T. Glover is head of mathematics at St. James Independent Schools in London. He is director of mathematical studies at the School of Economic Science and a Fellow of the Institute of Mathematics and its Applications. He has run public courses in London on Vedic Mathematics.